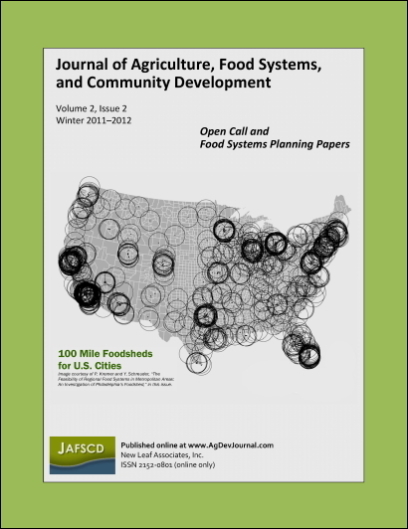 JAFSCD volume 2, issue 2 (winter 2011-2012) with open call papers and additional papers on the special topic "Planners Coming to the Table." METRICS FROM THE FIELD: How Do We Grow New Farmers? "Food Security" and "Food Sovereignty": What Frameworks Are Best Suited for Social Equity in Food Systems? Is a Geographical Certification a Promising Production and Commercialization Strategy for Smallholder Sheep Farming in Ceará, Brazil?